The C-12 Huron is a military version of an executive passenger and transport aircraft based on the Beech Model 200 Super King Air. It is primarily used by the US Air Force, US Navy, US Army and US Marine Corps for several functions, including range clearance, embassy support, medical evacuation, VIP transport, passenger and light cargo transport. The C-12 took its maiden flight on 27 October 1972 and entered service with the US Army in 1974. The C-12 Huron prototype is designed and manufactured by US company Raytheon Aircraft Corporation. Powered by a twin-engine turboprop, the C-12 aircraft is manufactured by Raytheon Aircraft Corporation (RAC) in the US. The aircraft can accommodate a maximum of two crew, namely a pilot and co-pilot, and 13 passengers or 5,000lb of cargo. More than 300 aircraft are currently in service with the US armed forces. The C-12 Huron is the mainstay of operation support airlift (OSA). System Field Support (SFS), a subsidiary of L-3 Communications, was contracted for $440m in 2010 to render Life-Cycle Contractor Support for the fleet of C-12, RC-12 and UC-35 aircraft, deployed in the US Army, Army Reserves and Army National Guard, for five years. The US Navy and the US Air Force awarded a five-year, $300m contract to SFS in May 2011 to provide contractor logistics support (CLS) services to its fleet of C-12 aircraft. The C-12 aircraft comes with 13 variants – C-12A, UC-12B, TC-12B, C-12C, C-12D, C-12E, C-12F, UC-12F, RC-12F, C-12L, UC-12M, C-12R and C-12R/AP. 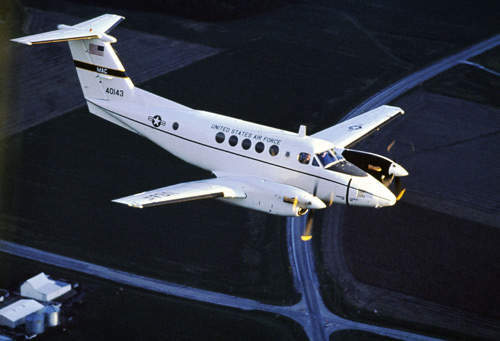 The C-12A is based on the initial model of King Air A200, which entered into service in July 1975. 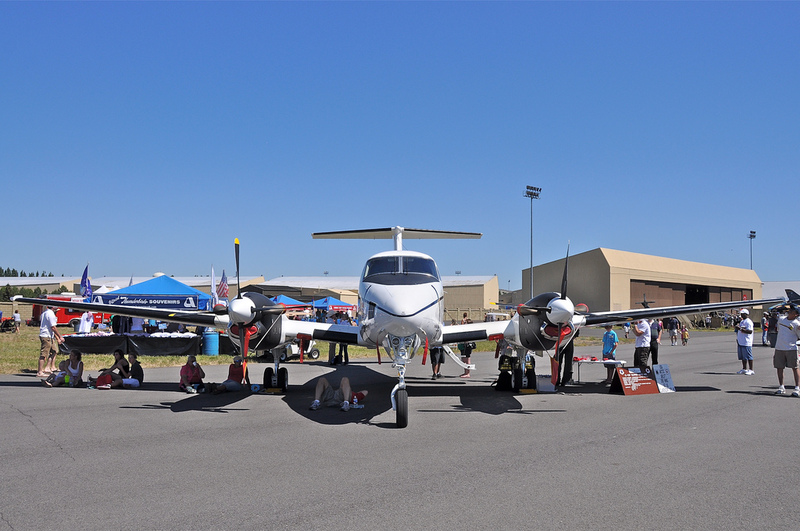 Two P&WC PT6A-38 turboprop engines power the C-12A. The C-12C and C-12E variants were obtained by replacing the PT6A-38 engine of C-12A with PT6A-41 turboprop engine. The variants are similar to C-12A in terms of applications and specifications. Picture from Flickr.com from Jethro as found here. The TC-12B is an advanced trainer aircraft principally used for intermediate E2/C2 training at the Naval Air Station, Corpus Christi, Texas, US. The de-icing and anti-icing systems installed in the aircraft allow flight operations under instrument and icing conditions. Around 14 UC-12B aircraft were converted to TC-12B. The C-12D aircraft is similar to C-12C and is derived from King Air A200CT. The variant is equipped with a cargo door, high flotation landing gear and purvey for tip tanks. Approximately 21 C-12D were converted to guardrail common sensor aircraft, the RC-12. The C-12F can carry two crew and eight passengers. The variant is derived from King Air Model B200C and can lift 1,050kg of cargo. The UC-12F, the naval version of C-12F, is currently in service with the US Navy. Variations of the UC-12F include the addition of a surface-search radar and an operator’s console to RC-12F range surveillance aircraft (RANSAC) for the Pacific Missile Range Facility at Barking Sands, Hawaii. The C-12L is an advanced version of the RU-21J, minus guardrail equipment, and is frequently used for transportation. The RU-21J was renamed as C-12L in the 1980s. The UC-12M is another naval version, which has been achieved by modifying the cockpit instruments, lighting and voice communications of the C-12F aircraft. The C-12R/AP is fitted with surface search radar to detect and track marine targets. It also captures videos of suspect drug traffickers for further use in criminal proceedings. The C-12 is powered by two Pratt & Whitney Canada PT6A-42 turboprop engines, which can produce a continuous power of 635kW each. The engine is also equipped with a full authority digital electronic control (FADEC) feature, which reduces the workload of pilot and decrease fuel consumption. The length and diameter of the engine is 66.9m and 19m respectively. It can produce a revolution per minute (rpm) of 2,000. Read the full article over at Airforce-Technology.com.